Blogging Break Today — Back Monday! In case you’re not up on Mayor Bloomberg‘s re-“vision”ing of Coney Island, here are some sites with the most up to date information. Okay, this one is not really Mayor Mike’s “plan,” as so many others are where he’s behind the curtain pulling the strings, like Washington Square Park. But we know he’s engaged because it involves destroying the collective memory and history of a beloved place in New York City. That’s our Mayor’s specialty. 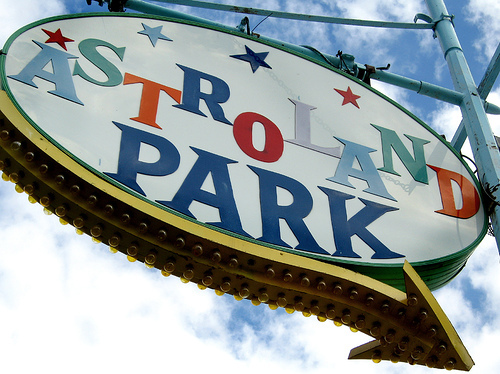 iconic Astroland Rocket, had been donated to the city and would remain in Coney Island. We now have more details from the city, where a full cast of characters, including City Planning Director Amanda Burden and Deputy Mayor for Economic Development Robert Lieber showed up for the announcement and photo op. First the good news: the iconic Rocket isn’t going to Pakistan. Now the bad news: Sources tell us it’s leaving tonight for shipment to Staten Island, where it will remain until it comes back as part of the amusement park the city wants to build. Not to be the skunk that wanders into the Garden Party, but In practical terms, this means it could be a loooooooong time before it returns to Coney Island. * To see some great photos of Coney Island in its hey day and now, check out the new Coney Island blog. * And for an overview of what’s happened thus far – the big player in this drama is a corporation called Thor Equities which bought up a lot of the land and put For Rent signs up on the businesses on the boardwalk and main drag right around Christmas last year which broke many people’s hearts – visit the Save Coney Island site. What and who defines public space in New York City? amNY today delves into the Bloomberg Administration‘s “vision” for transforming New York’s public spaces. Yet, the article doesn’t touch upon parks as public space which is too bad because highlighting what the Bloomberg Administration has done to take away and adversely impact public space at Washington Square Park, Union Square Park, the giveaway of Bronx parkland to the Yankees, the privatization of Randalls Island, etc. would counter city “planner” Amanda Burden‘s gushing spin on the whole thing. Ms. Burden and Mayor Mike’s idea of expanding public space is more about putting tables in the midst of city streets (seriously) and not so much about how people interact. It is more about figuring out how tourists can sit and have a cup of coffee amidst Times Square congestion versus people actually engaging with one another in unplanned, unusual and spontaneous ways. That sounds great — until you look closer. When city “planning” starts worrying too much about changing a city as unique as New York for tourists and doesn’t preserve what New Yorkers already love about their city, I think there is a problem. “The Vanishing City” event a success ! The Vanishing City event Saturday night 1/24 at The New Dixon Place (a pre-opening event) was a sold-out success! The film “Twilight Becomes Night” movingly emphasized why our local “mom and pop” stores are so important to communities (and our sense of community) vs. endless blocks of Duane Reade, Chase banks, Staples, and Starbucks. The preview trailer of the film “Vanishing New York” looks great. I met the filmmakers Jen Senko and Fiore DeRosa and look forward to seeing the finished result coming this spring. Kirby from Colonnade Row organized the event. (You can read his report back on it here.) New York State Assembly Member Deborah Glick was particularly hard hitting and didn’t spare any words as to her feelings about Mayor Bloomberg! (Hint: Not so positive.) All the panelists, the moderation, the vibe, etc. were excellent and the turnout reflected the interest – and concern over – our Vanishing City. The topics discussed – the non-stop giveaways to developers and corporations under the Bloomberg Administration; the lack of emphasis on preserving and valuing community; people and their neighborhoods being sold out for the benefit of real estate interests and “luxury” housing; community members being denied a voice in the “process” – are all relevant in relation to what’s transpired at Washington Square Park thus far. When asked, Andrew Berman from Greenwich Village Society for Historic Preservation (GVSHP) didn’t have a clear answer as to why his organization supported – or purposefully abstained from taking a real position on– Mayor Bloomberg’s radical revisioning of Washington Square Park. I have a lot of respect for the work GVSHP does. But that decision truly is a puzzling one. The old ‘line’ that the park needed a “renovation” just isn’t an appropriate one anymore. We all agree on that. The work being done is not a renovation. (In discussing Washington Square Park, Deborah Glick spared no words for the New York City Parks Department declaring it “arrogant” and stated that the tone is set from the top – meaning Parks Commissioner Adrian Benepe. Correction: I’ve been informed that she meant Mayor Michael Bloomberg. Unfortunately, they’re both arrogant!) Berman asserted that landscape designer George Vellonakis, who is in charge of the park’s redesign and inexplicably also on the board of GVSHP, recused himself from any votes in the matter. But the fact that he’s on the board is telling enough. A topic I’ve tried to explore on Washington Square Park Blog over the last year are the dramatic changes going on in New York City under Mayor Bloomberg. Our CEO Mayor’s pro-development, pro-corporate interests, massive re-zonings, and anti-community initiatives are all dramatically accelerating the pace of change in New York, destroying the fabric, the underpinning, of what makes New York New York – its unique, gritty, welcoming to all, pace-setting, dynamic edge. Evidence of these initiatives exist across the city’s five boroughs. See: Coney Island, Willets Point, Yankee Stadium land grab and park destruction in the Bronx, Lower East Side/Chinatown re-zonings, Brooklyn’s Atlantic Yards debacle, NYU and Columbia University’s mammoth, soulless expansions, the overtaking of Harlem, and, of course, Washington Square Park, among too many others. We can welcome the future without bulldozing the past. But not Mayor Bloomberg and his corporate allies … they wish to create a homogenized, bland version of New York. Emphasis on corporatization, privatization, tourism, real estate, Wall Street (you see how well that’s been going, eh?). To do this, the past must disappear. It challenges and hinders their efforts. It reminds people of what once was – and can be. Now, at last, an event, with two films and discussion, is happening, the first of others, the organizers say. Proceeds benefit the funding of the film “Vanishing New York” and community programs at Dixon Place. Luxury development is radically changing the face and faces of New York City. The middle class, small businesses and artists are being priced out at an alarming rate. You can’t stop development, so how then do you preserve the things that make this city one of the most unique places in the world? Jeremiah at Vanishing New York blog (not affiliated with the film) interviewed the director of “Twilight Becomes Night,” Virginie-Alvine Perrette, here. New Blog entries resume Monday, January 26th! New posts return Thursday, January 22nd. Meanwhile, there are 308 posts in the archives. Check the Categories (right hand side) for the topic that peaks your interest. These were taken with a cell phone camera so they are a bit, um, grainy, but you get the idea! I’ve wondered if NYU owns every building around Washington Square Park but it turns out there was at least one they did not own – but now they do! As the Real Deal reported December 30th, NYU is in the process of buying 58 Washington Square South, currently Holy Trinity Chapel, a Catholic Church, which is being sold by the Archdiocese of New York as it claims hard times. The sale had to be approved by a judge since it involves a religious institution (I wonder what would have negated the deal?). NYU says it plans to use the building for academic and “multifaith” uses. The City section in the New York Times weighed in yesterday and Colonnade Row wrote a piece about it over the weekend. NYU claims they will only build 6-7 stories high (it’s currently two) as opposed to the much unloved 10 storied-Kimmel Center next door (doesn’t that seem taller?). When the church sale was still in the discussion stage in August 2007, the Villager covered the potential sale. John Sexton, NYU President, was interviewed sounding all pleased with how community minded he was being, since zoning code allowed him to build taller (12-14 stories) – but he didn’t plan to. Sexon asserted at that time that the archdiocese had “an alternate buyer.” Yet a spokesperson for the archdiocese, Joseph Zwiller, denied that there was any buyer they were considering other than N.Y.U. You might be wondering… Why not? … Please let this land-grabbing institution release its stronghold on Washington Square Park! Good neighbors to the community…? NYU is a good neighbor to NYU and that’s it. The archdiocese powers-that-be clearly do not live in or talk to anyone in the community or Zwilling would not be spouting such incorrect information (bordering on insanity). I gather the NYU Prez is worried about “the blue sky” and being a “good neighbor” when it suits him. And while no one was that attached to the Holy Trinity Chapel’s architecture it seems … it’s an odd little building, and the magnificence of its Stanford White-designed neighbor across Thompson Street, Judson Church, probably hurt its chances of getting much love and attention … the idea that NYU now owns it is a bit of an “ouch” factor. Update: Read Room 8 blog‘s piece dissecting each of the “9 points” of the Bloomberg “9 point plan.” Well done! Many voters are appalled by what they see as his [Bloomberg’s] power grab. This refers to the way he and a compliant City Council majority trampled on the will of the people, as expressed in two referendums, by treating themselves to a shot at third terms. Mr. Bloomberg’s task now is to convince voters — and he’ll spend whatever portion of his billions it takes — that without him remaining at the helm in these dark days, we are done for. “We will get New York City through these hard times with the same approach that has always worked for us: independent leadership based on facts and pragmatism, not politics and ideology,” he said. “Politics” is Bloomberg-speak for what everybody running for office does — except for him. “Ideology” is an adherence to certain fundamentals of democracy that he finds inconvenient. I think Mr. Haberman, while strong on the term limits issue, is not quite hard hitting enough about the Mayor’s record to date, touting the same statistics and notions that his p.r. department does (that people overall believe he’s been good for our city, etc., etc. ).